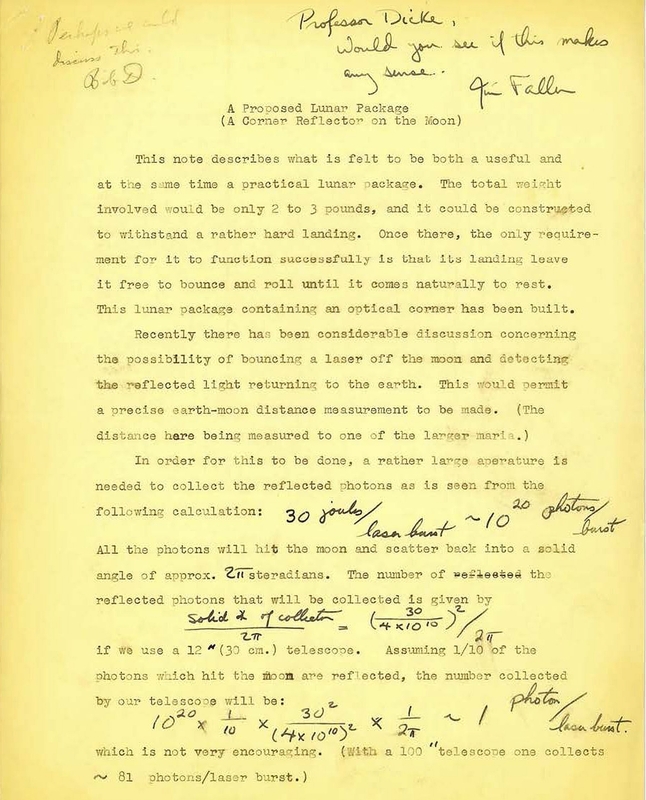 The first page of James Faller’s 1962 draft paper describing his concept for a lunar laser retroreflector. Note the commentary between Faller and his mentor, Princeton physicist Robert Dicke, as well as Faller’s handwritten calculations. What would have been even more unimaginable at the time to Faller—now a fellow adjoint at JILA, the Boulder, Colorado, physics laboratory jointly operated by the National Institute of Standards and Technology (NIST) and the University of Colorado—was that just seven years later, the first men on the moon, Apollo 11 astronauts Neil Armstrong and Buzz Aldrin, would make his vision a reality. During their historic moonwalk on July 20, 1969, Armstrong and Aldrin deployed a laser retroreflector based on Faller’s design (submitted to NASA in 1965 and approved three years later) on the surface of Tranquility Base. Apollo 11 astronaut Edwin “Buzz” Aldrin looks over Tranquility Base, site of mankind’s first lunar visit in July 1969. 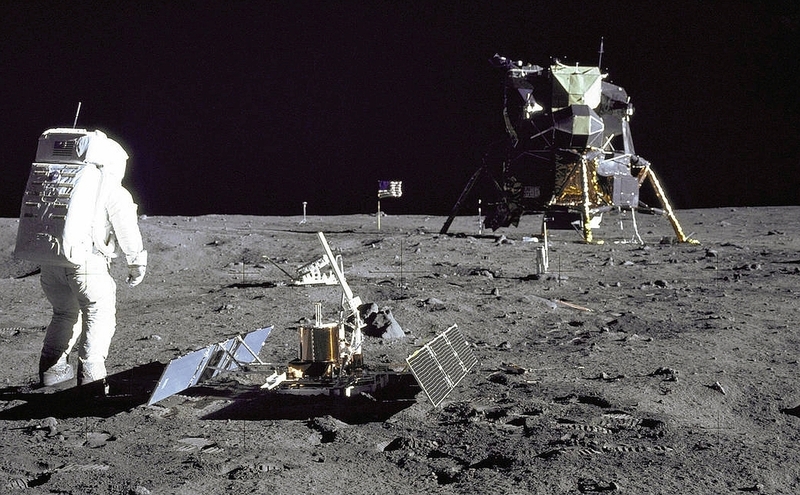 The laser retroreflector deployed by Aldrin sits in the center of the photograph, halfway between the astronaut and the lunar module. The 46-centimeter (18-inch) square array contained 100 corner cube prism reflectors, special mirrors that send any light striking them straight back to its source. Less than two weeks later, on Aug. 1, 1969, a laser pulse aimed through the lens of the 3-meter telescope at California’s Lick Observatory successfully hit the array for the first time. By measuring the time it took for the beam to return—about 2.5 seconds—scientists could use a simple formula [distance = (speed of light multiplied by the time taken for the light to reflect)/2] to define the distance between the Earth and the moon with a remarkable precision of plus or minus 25 centimeters (10 inches). The laser retroreflector left on the lunar surface by the Apollo 15 astronauts and a diagram showing its components. The corner cube mirrors that reflect laser light back to its source are clearly seen in the photograph. NASA officially terminated the Apollo Lunar Surface Experiments Package (ALSEP) project on Sept. 30, 1977, making the three corner cube arrays—the original Apollo 11 instrument and similar devices left on the moon’s surface by the crews of Apollo 14 and Apollo 15—among the most distant historical artifacts with a NIST connection. Even in retirement, the devices are still being independently used by different observatories around the world. With today’s more sophisticated laser ranging systems, the precision of the Earth-moon distance measurement is now approximately 1 millimeter (0.04 inch), 25 times better than the first calculations in 1969. By comparison, that’s approximately equivalent to determining the distance between New York and Los Angeles to 0.01 millimeters (0.0004 inch). The lunar laser retroreflector conceived by Faller has been called “NASA’s most cost-effective experiment,” not only for its long duration but for the vast amount of scientific knowledge it has provided. Along with the Earth-moon distance measurement, the devices have revealed that the moon is moving away from the Earth at a rate of 3.8 centimeters (1.5 inches) per year, our satellite probably has a liquid core, and the universal force of gravity is very stable (with measurements showing that Newton’s gravitational constant has changed less than 1 part in 100 billion since the laser experiments began). 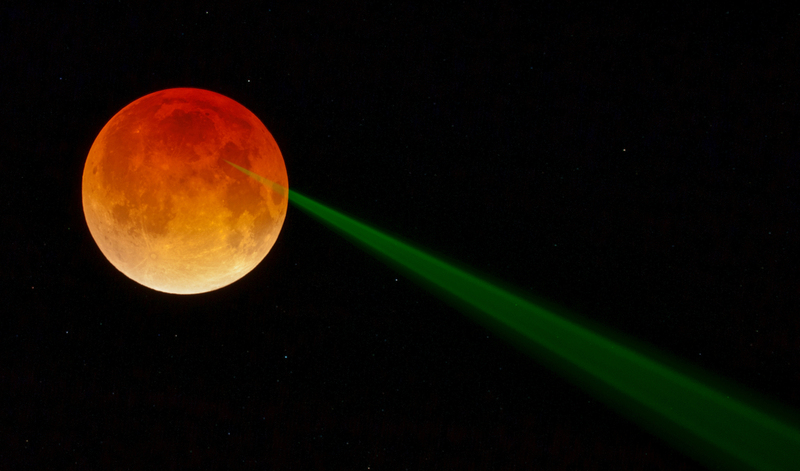 During a 2014 lunar eclipse, a laser beam was shot at the Apollo 15 laser retroreflector. Besides the retroreflectors at three Apollo landing sites, two others reside on the moon aboard the unmanned Lunokhod 1 and Lunokhod 2 rovers from the former Soviet Union. Hitting one of the retroreflectors with a laser beam from Earth has been compared to using a rifle to hit a moving dime 3 kilometers (1.9 miles) away. An expert in precision measurement and gravitational physics, James Faller once conducted an experiment that disproved a claim by other researchers that they had achieved antigravity.